A lot of Alabama fans are saying that Auburn just got lucky to be in the position that they are in right now. Especially after what happened in the Georgia game with the Hail Mary pass that bounced off the Georgia player for a miracle touchdown. Nick Saban doesn't buy into that theory. "I don't think they were lucky to win," Saban said of the Georgia game. "I'm not saying that at all. "They really probably deserved to win the game, based on how they played in the game, and they got rewarded for it in the end by making a big play." It's usually just good fun for Alabama fans to discount their state sibling in what is being called the "Mother of all Iron Bowls", however Auburn is indeed good this year. In fact, though saying that you can throw out the record book is so true for the Iron Bowl. Auburn is going to be home and the fans are going to be jazzed up and rocking the stadium. It's not going to be easy but Coach Saban will Alabama ready to go against the #4 Auburn Tigers. The winner gets to play for a chance to play an SEC championship and potentially a national championship. Even in 2010, in Auburn's national championship year, when Alabama had a couple losses, Alabama was favored to beat Auburn. Alabama jumped out to a big lead only to lose to another one of Cam Newton's magical comebacks. This year, Auburn has a very similar feel to their team with a mini- Cam Newton known as Nick Marshall. Gone is Michael Dyer, however Tre Mason is one of the top rushers in the SEC. Auburn's defenses been little porous this year, however it seemed of gotten the job done in all games but one. In the Georgia game, Dee Ford flattened Aaron Murray to preserve a victory at the very end in a game that could of been easily been lost even after the miracle throw by Nick Marshall. 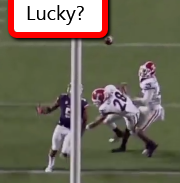 Anytime a team wins 10 games in the SEC, even if it is Auburn... it's not luck. It's good. Let's just hope that Bama plays better!